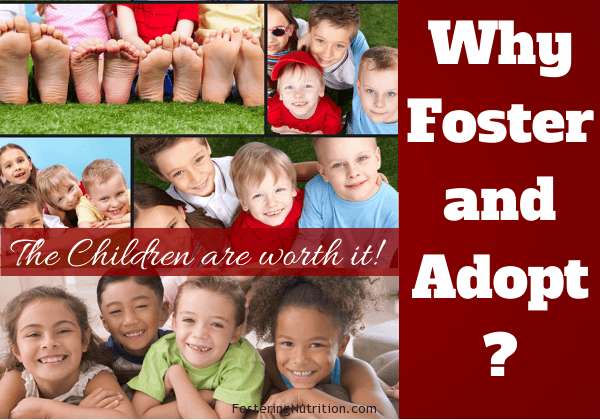 Why Should I Foster and Adopt? Foster families are amazing! Fostering provides a wonderful family and home for a child who needs both! 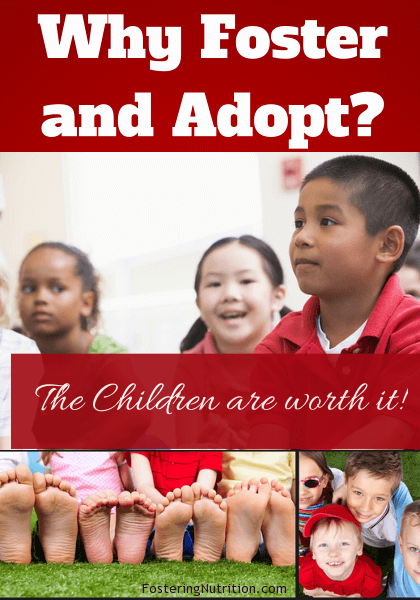 The strange thing is that there are so many families who want to adopt for various reasons. The reasons are numerous; some are compelled by passion (like our family), some are not able to have children and some have older children but have more love to give. All these reasons and more are GREAT reasons to foster and adopt. My hope is to help educate you on ways you can affect change to the entire world, one child at a time. Every child should have an opportunity to be great. And when bad things happen and life gives you lemons, you make lemonade. From a child’s perspective, the biological parent(s) could have a bad situation and therefore they are in need of a temporary or permanent home. Any way you look, fostering and potential adoption are terrific ways to help a child, help a parent, and help a community! 1. There are around 460,000 children in the USA who are in foster care and/or orphanage homes, over 13 Million orphans in the world (losing both parents). We have become so politically correct that we call these group homes, children’s homes which has a nice sound, but I fear that the general public is completely unaware of this problem. 2. The problem is that not enough good people are looking to foster-and-adopt our children. Rather than shooting for a straight adoption, waiting for years…why not help out the community and yourself. Practice makes perfect…and in this case provides love and a home for a child. Basically we could change this world if just a few more families would foster and possibly adopt 1 child! The possibility gives me chill bumps. So many childless families are waiting for years to adopt and they could be loving a child while they wait and as a bonus get some practice in with a child who deserves love in a family. Therefore, optimally, it would be beneficial for both the child and the parents to engage to foster and adopt. 3. You can help out a child or children in your local area. Many are adopting internationally, which is great, but we also need to consider adopting our own children. And today the average age for adoption through the fostering system is about 8 years old. So younger children and older children need adopting, but this important age of 8 has the greatest need. Many times, these children come into the foster system at very young ages. They go back to a biological parent and it doesn’t work, so they come back into foster care. After several years these children are available to be adopted as the parent is unable. If a child does not get adopted they “age-out”. Statistics on Foster Care- YOU could change! Unfortunately, from 1998 – 2005 an increase of 41% more of these children in Foster Care or Orphanage Homes “aged out”. Once I was meeting a Case manager and the office was having a party with an 18 year old. I asked the occasion for celebrating. The response was, “Oh, he has graduated and aged-out of the system”. So I respond like anyone and ask, what is “aging out”?. Well, it means that you have never been adopted into a family but you are not going to be fostered anymore; a more independent status. I wanted to cry! But instead I ask why they were celebrating something that seems so sad. A very wise Case Manager tells me that you take what you get and make the best of it; so the State tries to make a celebration to mask a sad disposition. 4. Helping out these children will build a BETTER COMMUNITY for you! 5. You get to experience the child in your family. 6. If a child comes up for adoption, it is an easy transition because the child is already in your home. Truly we could change this world if just a few more families would foster and possibly adopt 1 child! The possibility is incredible. So many childless families are waiting to adopt and they could be loving a child while they wait and as a bonus get some practice in with a child who deserves love in a family. Therefore, optimally, it would be beneficial for both the child and the parents to engage in foster care and eventual adoption when available. Look at these great sites to learn more about the children USA [Here] England [Here] and read more on How to Foster and Adopt. Look it up for your state, province, and country and see how you can get involved.